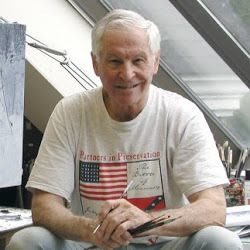 The Judge Advocate General’s Legal Center and School Alumni Association commissioned Mort to do a painting of the Lieber Code, which became the basis for all international treaties, including the Hague Conventions and the Geneva Accords; and now, almost 150 years later, it is still considered the most significant codification of the customs and practices of war. 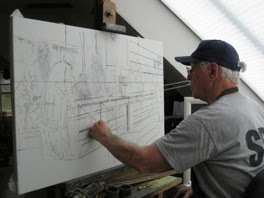 Before painting, Mort draws in charcoal directly onto the canvas. 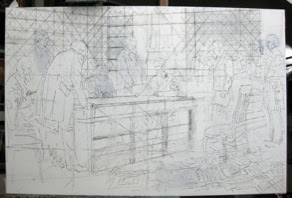 Above, on the left, you can see Mort drawing up the canvas, with a photograph of the finished drawing on the right.